9 Foot Inflatable Movie Screen | San Diego Kids Party Rentals | inflatable | San Diego Kids Party Rentals | bounce house rentals in San Diego and La Mesa, CA. Movies under the Stars in your own Backyard! This is the perfect backyard-size movie screen! The freestanding screen area is 9' x 5' with a 123" diagonal projection surface and 16:9 aspect ration. 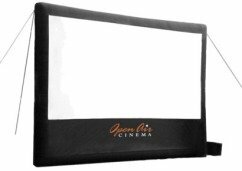 The inflatable movie screen is designed to provide optimum tension for the projection surface without the work of tying, clipping, or zipping on a projection surface. This portable screen and audio-visual system can also be used for video games, presentations (connects to a laptop for PowerPoint or other presentation software), NFL football parties by connecting to a T.V. (consider the lighting and time of day of the game), or Music Videos for Dance Parties. You select and provide the movie and adhere to any relevant licensing conditions. Typically licenses are not required for back-yard private movie showings, but they are required for any public showing. For details on obtaining licenses, go to swank.com or call them at 1-800-876-5577. NOTE: If you book on-line, the latest default pick-up time is 7:00 PM, please select that and recognize that in actuality, we will arrange to pick it up the following day. Thanks!